Watch people around a globe. First they look at it, then they might touch a country, and then, almost universally, they spin it. Globes, it seems, are irresistible. It is no wonder that many groups have globes for their emblems – the United Nations and the World Bank being famous examples. Movie studios are not immune to this global attraction. It is no wonder that globes have appeared either as a studio identity icon, or featured in movies themselves. As a movie studio identity, probably no other globe can take credit for appearing in as many movies (more than 3,400 and counting), and in as many incarnations, as the Universal Studios globe logo. This globe appears in most of Universal Studios/Universal Pictures films. It's evolution is traced in this My Filmviews article, but they look much better animated, as in this YouTube compilation. Huge, revolving metal versions of this logo are found as fountain centerpieces in the various locations of the Universal Studios theme parks all over the world. Then there's the Golden Globe Award statuette of the Hollywood Foreign Press Association (HFPA). This features a globe hugged by a film strip – in solid zinc plated with 24-karat gold. Although this globe is all about excellence in movies and TV, no one remembers this globe being featured in a major movie. Inside movies themselves, globes are more often featured as part of an orrery, a movable model of a solar system (ours or someone else's). Take for example in the The Dark Crystal (1982), where the character Aughra had one in her observatory where she demonstrated the Great Conjunction. 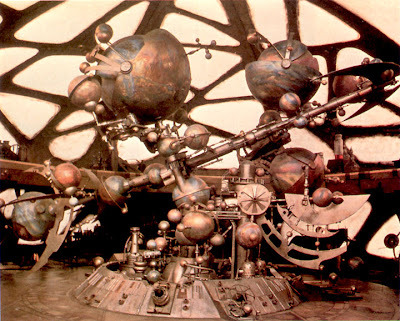 This orrery was a complex affair, giving us the idea that the movie was set in a very strange, alien world. In Tomb Raider (2001), a huge orrery featured as the background in the climactic fight scene where Lara Croft fought the main villain. In Prometheus (2012) the android, David, found a light globe of the earth in the alien ship. This globe, too, was part of an orrery – a holographic one. But even shorter, smaller-budgeted, more personal movies can benefit from an illuminated globe's warm glow. For example, in Vania Heymann's promotional video for White Night Tel Aviv 2013. Take note of the scene at 0:56 showing the moon and a lighted globe. Intimate – even without people. You, too, can bask in the light of your very own illuminated globe. Browse through our stock of illuminated globes in various styles and sizes designed to complement many room styles and budgets. You might just find the one that's perfect for you.